*The 2017 CF Zen USSSA lost its 1.15 certification in all sizes and lengths of the drop 10 2 3/4 and drop 8. This is the Blue/White 2 3/4 as well as the drop 8 Green/White one. As well, the bats zero dark thirty and custom versions are also decertified. Serial numbers that start with: WTDXCBR & WTDXCBZ. **The 2018 CF ZEN USSSA lost its 1.15 certification, then gained it, then lost it, then gained it. As of 6/6/2018 the bats are LEGAL for play. And, although it is hard to believe, we think this one is actually here to stay. See DeMarini’s commentary here. ***The DSB KAMO lost its 1.15 certification in the 31 and 32 drop 10 (so 31/21 & 32/22) as well as the 30, 31 and 32 drop 8 (30/22, 31/23, 32/24). After a huge amount of hullabaloo, USSSA decided today that the 2018 CF Zen is now re-LEGAL for play. They are removed from the banned list. We have updated that information below. You can find insight/return information via DeMarini here. After further consideration AFTER their original further consideration, all sizes in the CBZ drop 10 DeMarini 2018 CF Zen are LEGAL for play. USSSA adds the 28, 29 and 30 inch 2018 CF Zen to the banned list that included the 31 and 32 of the same bat. They also clarify the 2018 Ghost X USA will NOT be allowed in USSSA games. USA Baseball decertified (made illegal) the USA Easton Ghost X bat in a 30 inch drop 10 in the 30/20 on 5/3/2018. From what we’ve read on social media, Easton is offering a $500 voucher on their website for the return of a legitimately purchased USA Ghost X. Return questions via Easton can be directed to Easton via email at ghostreturn@easton.com or at 1-844-531-7079. 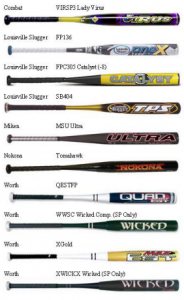 More information can be found on USA bats decertified bats page. 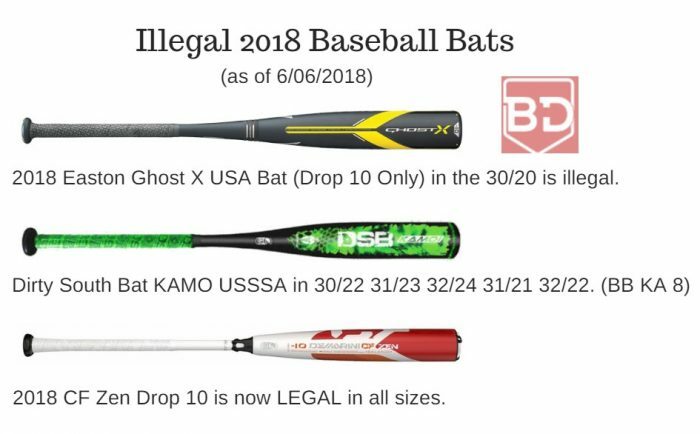 The USSSA announced on 4/12/2018 at 4pm PST that the Dirty South KAMO with serial number BB KA 8 is illegal for play in the following sizes: two drop 10’s and three drop 8’s (30/22 31/21 32/22 31/23 32/24). The DSB KAMO (BB KA 8) has been withdrawn from USSSA play. This means, in not so many words, the bat is now banned for play. This includes the 30/22 31/21 32/22 31/23 32/24. All the people saying Dirty South bats were hot were, clearly, right. Apparently a little too much so. We are sure it is a huge headache to deal with but, for what its worth, they might take some solace in knowing they are in good company. They simply don’t make crappy bats illegal. (See our DSB Made USA Bat Review. This one is perfectly legal). And, we should note, several of the KAMO’s are still legal. Are they (DSB) going to be able to withstand the capital and inventory issues associated with getting a marquee bat of theirs recalled? If they can, expect them to get a long term bump (akin to Anderson and the Techzilla). These bats are the banned KAMOs (including 3 drop 8’s and 2 drop 10’s). With the recent, and rather high profile, “temporary” decertification of the 2 3/4 DeMarini CF Zen drop 10, we wondered what other bats have been de-certified over the years. It is not easy to find such a list. Likely, we have decided, because there simply have not been many baseball bats over the years that have been banned. Slowpitch softball has seen the worst offenders—with at least a dozen bats getting banned over the years. In the baseball space we have found only 3 in the last 5 and we have yet to find a fastpitch bat to get the boot. 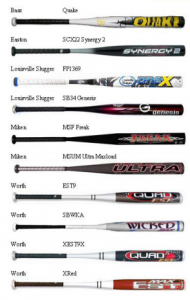 A couple of sites, like ezteamsports, had a good list of softball bats that have been banned over the years. It does not look to be updated very recently, but was useful nonetheless. As well, SFsoftball has a similar list. On the baseball side, one league site has at least some information on what bats are banned. The Texas Association of Sports Officials appears to be keeping at least some tabs on what bats are illegal. Although it does not tell you what bats are decertified, the WSU site tells you what bats may have been originally certified. To become certified, a bat must pass a particular standard set by the governing body. These tests are performed by an independent sports science lab at a major university. If the bat passes then it is eligible to carry the stamping of the association. However, throughout the year, governing bodies randomly test bats. Picture it much like random drug testing at the Olympics. These governing bodies can buy the bats directly on the shelf or take them from tournaments directly. They are sent to the lab and then tested. If a bat does not pass it is removed from play and becomes “decertified”. Although likely others, we can find three bats that have lost their certification over the last few years in the baseball space. They include the CF ZEN 2 3/4 Drop 10, the Marucci CAT 5-squared in 32 and 33 BBCOR and the Reebok TLS. Those three lost their certification in both highschool and collegiate play. The Marucci Black 33 and 34 inch bat lost its certification for NCAA play only. Trying to make a play on the scene, the Mattingly brand of bats produced a super hot stick in the Balistk. Apparently, too hot. Mattingly bats never quite took hold and, as of today, they’ve yet to produce a new bat in years. Find a Balistk on Ebay. A few years back, Nike made a serious run at the baseball bat space. However, the CX2 losing its certification appeared to mark the beginning of the end for the Nike Bat experiment. Holding the distinct honor as the only drop 12 bat to lose its certification, Louisville Slugger’s 2012 Dynasty was one of the very first BPF bats to be banned. As the only non-BBCOR bat on the list, the CF ZEN 2 3/4 was a dynomite bat that people raved about. It did have some durability concenrs, but people still bought the bat in droves as it gave little timmy’s across the universe chances to hit it into the stratosphere. Find a CF Zen 2 3/4 Drop 10 on Ebay. The CAT 5^2 (5-Squared) in BBCOR was a beastly bomb dropper known for killing balls. It put Marucci on the map, but also got de-certified after folks found it too hot to handle. Most were not aware Reebok made a baseball bat. Indeed, the TLS was legit. But it became decertified and Reebok never quite recovered in the bat space. The BBCOR 33 inch was banned in both highschool and collegiate play. Find a Reebok TLS on ebay. The Marucci Black bat has the distinct honor of getting banned by the NCAA but not by the NFHS. That is, college said you’re out while high school said you’re safe. Strange turn of events and we don’t quite follow how that could happen considering both leagues use the same standard. But, nonetheless, there it is. 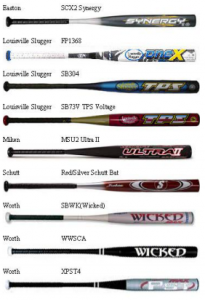 The list of illegal softball bats is longer than we care to write about. Or, frankly, you should care to read about. As an example, let us simply picture the ASA bats that have been decertified up until 2014 only. Just the drop 10. Drop 11 is the JBB version of the bat and legal.